The Albins ST6-i picks up where the Turbo 400 leaves off. With 6 forward gears, the sequential-shifting Albins ST6-i can be tailored to match your engines power output. Built-in drop gears mean there is no need for an under-drive unit to run taller (meaning stronger) rear-end gear ratios. With a range of drop gears from 1.04 to 1.61, it's always possible to obtain the right gearing. Learn more about Albins ST6 Series Gearboxes. Unmatched versatility. The Albins ST6-i can be configured for front engine, rear engine, 2WD or 4WD applications. Additionally, the ST6-i can be run with a clutch only, converter only or converter with clutch back up. The ST6-i can also be configured with various bell housing styles and depths, 9” or 10” torque converters as well as other options. Proprietary wet clutch for ST6 4WD applications. 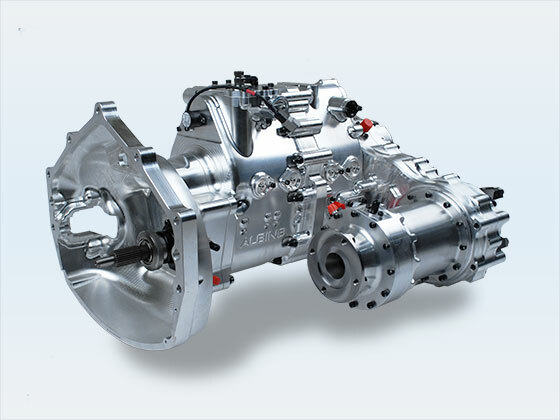 A specially designed Albins wet clutch assembly is used for the front-drive output to pneumatically control slip at a predetermined torque spike and manage front-drive force depending on various inputs from the truck and drivetrain. Albins Stand Alone Differential for 4WD. The Albins AFD-100 Stand Alone Differential features a billet housing designed as small as possible to keep space requirements to a minimum. Input drop gears allow matching of rear gear ratios and let the input flange location rotate up to 12 positions for greater versatility. This unit comes standard with an oil pump and a planetary differential but can also be configured with a locker, spool or limited-slip.